Regardless of which years each of us spent at camp, I bet similar colors and scenes come to mind when we reflect on our time there. I can close my eyes and picture the black, blue, red, and yellow rings of an archery target, set against the backdrop of lush green trees. 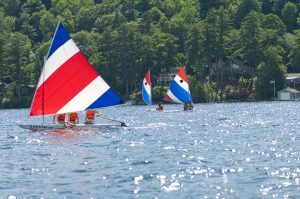 Or at the waterfront I see the weathered white of the H-pier and the classic red, white and blue sails of the sunfish, filling Chestnut Cove. Up at the Craft Shop there is a beige layer of sawdust on the floor and fresh white ceramics lining the walls. 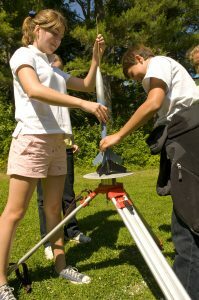 On the front lawn I see a neon, spray painted model rocket launching high into the bright blue sky. Our activities are colorful in nature, but they are also colorful in variety. Just as a balanced diet of different foods is important for our health, a balance of rich learning experiences is healthy for our children. Camp is a wonderful, non-committal environment to try new things. If something piques your interest, you can do it again, working towards mastery of your goals and earning awards. If it’s not your thing, there are so many other choices to try out next! 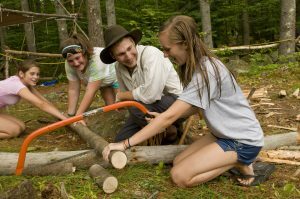 How many of us have tried something for the first time at camp and then went on to pursue it as a lifelong hobby? 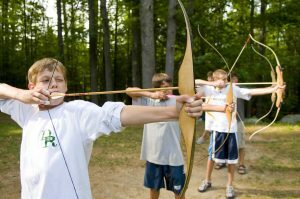 At Brookwoods and Deer Run, campers sign up every weekend for three new activities for the following week. It’s a crazy, loud, somewhat overwhelming process as campers try to decide what they want to take, when they want to take it, and with whom. There are certain activities that always fill up right away. Wyn Byker consistently has a long, very straight line for Archery. The campers signing up for wake-boarding and waterskiing form a rowdier clump, but are just as enthusiastic. Some of the popular activities are ones you might not expect, and every summer it seems to be a different trend. Junior Unit campers can’t get enough of Women of the Wild or Boys of the Backwoods, an introductory nature exploration and wilderness skills class. Volleyball has been incredibly popular in recent years, especially at Deer Run. Two summers ago the entire Bear cabin wanted to take Sewing! 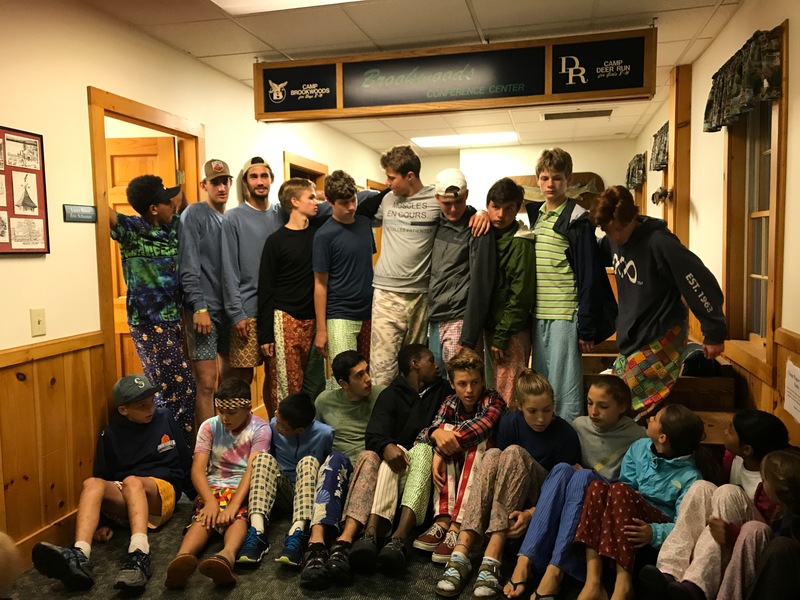 They made themselves pajama pants and many of them were sporting those pants the following summer, as LDP 1s. As you can imagine, cake decorating is another new and desired activity, and not just because campers get to eat their work! Summer after summer, the couches of Moose Hall are filled as John Harutunian reads C.S. Lewis’s Narnia books. God created a beautiful and vibrant world for us to enjoy. As His children, we are just as unique and varied in our gifts and abilities. I have great joy in watching campers not only learn about God’s love, but also experiencing who God made them to be as they embrace challenges and celebrate their accomplishments. 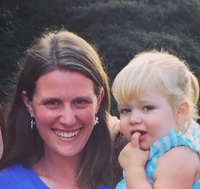 Sarah Cohen loves her job as the Brookwoods and Deer Run Program Director. Other jobs she’s held at camp include Whitetail counselor, Junior Unit Director, and LDP counselor. Sarah is a former 2nd grade teacher, now stay-at-home mom who brings her whole crew to camp every summer! She is mom to three future campers, Jacqueline (5), Paul (2), and Audrey (5 months). Jacqueline loves breakfast cookout and can be found “selling” free sticks or painted rocks by the Eagle. George Bowling calls Sarah “Crash.” You’ll have to ask her why at Brookwoods 75th! If you have questions about camp contact Sarah here!